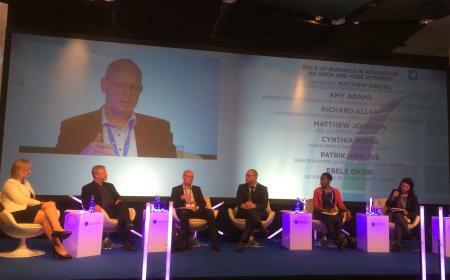 On April 28-29, 2014, Industry Dialogue members Patrik Hiselius of TeliaSonera and Yves Nissim of Orange took part in the Freedom Online Conference organized by the Freedom Online Coalition (FOC) in Tallinn, Estonia. At the conference, they engaged with stakeholders from over 60 countries around the world. Mr. Hiselius and Mr. Nissim participated in a joint Industry Dialogue-Global Network Initiative (GNI) panel, titled “The Role of Human Rights Impact Assessments in Advancing Rights Online.” They discussed their companies’ experiences conducting human rights impact assessments and shared useful tools and partnerships. Mr. Hiselius also spoke on a panel moderated by the Center for Democracy and Technlogy (CDT). Addressing “The Role of Business in Advancing an Open and Free Internet,” he discussed a number of topics including human rights reporting, sharing of best practices, and the importance of multi-stakeholder engagement. Here is the panel on the Role of Business.